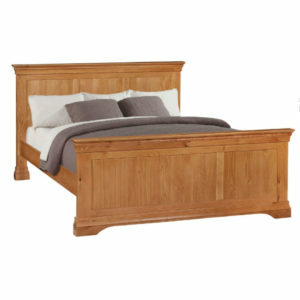 Home>Electric Adjustable Beds>4Ft 6inch Small Double Electric Adjustable Beds>Barryroe Wooden Electric Adjustable Bed. 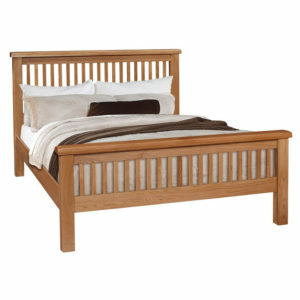 The Barryroe Wooden Electric Adjustable Bed is a beautiful simple Solid Oak bed with a Low Foot End . Scroll down, or Click Here for Full Price List of Barryroe Electric Adjustable Beds. It is a stunning feature for any bedroom. The photo is of a Single Mechanism/Single Mattress 4ft 6in (Small Double Bed) Barryroe Electric Adjustable Bed. The 5ft Barryroe is a Dual Bed, with 2 adjustable mechanisms and 2 mattresses, for independent movement. Superb matching bedroom furniture available to complement the Barryroe Electric Adjustable Bed. The Barryroe Electric Adjustable Bed is also available in Extra Long Length for the Taller Person.Click here for more information. 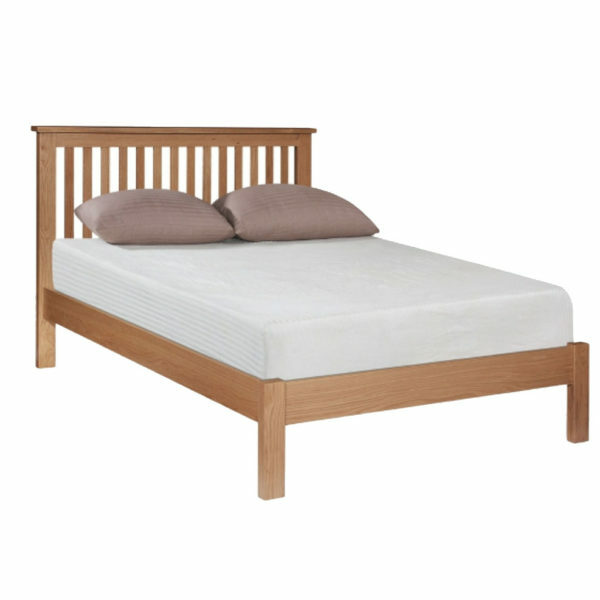 The Barryroe Wooden Electric Adjustable Bed is a beautiful simple Solid Oak bed style with a Low Foot End. It is a stunning feature for any bedroom. This bed comes with a 5 year guarantee on the bed base, and headboard. Most of our mattresses are also manufactured in Ireland. 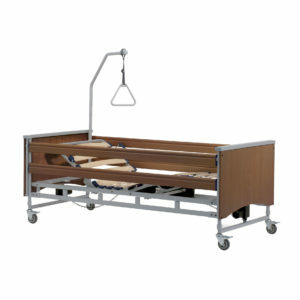 The Barryroe wooden electric adjustable bed is NOT suitable for a High Low/Vertical Lift/Carer’s Bed. The Barryroe electrical adjustable bed features a Low Foot End, this is not suitable for an high-low mechanism. This bed style is also available in a very stylish Cream Bed: Please see :Dunworley Electric Adjustable Bed. Size 3ft : is a Single Bed ,One Mattress, One adjustable mechanism. Size 4ft; is a Large Single, Ideal for one person, one mattress, one massage. 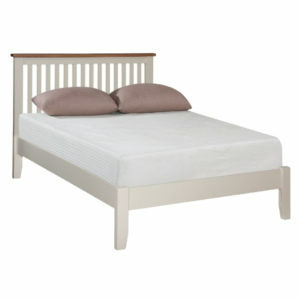 Size 4ft 6inch : is a Small Double Bed, One Mattress,One adjustable mechanism. Size 5ft : is a Dual Bed, with 2 separate mattresses,2 separate adjustable mechanisms, for independent movement. All our Wooden Electrical Adjustable Beds are fully delivered & installed by our trained engineers. The bed height for the Barryroe is 21 inches approx from floor to top of mattress. Colour : Solid Oak . Sizes Available : 3ft, 4ft, 4ft 6in, 5ft (Special orders can be made to any height or length). Our standard adjustable bed height is 22 inches from the floor to the top of the mattress (like most beds). We can make your bed to suit your needs. This bed has a 7 inch gap between the floor and the base, which is ideal when using a bed table or a hoist, or if the customer needs the assistance of a Carer. The Barryroe Wall Mirror complements the Barryroe Electric Adjustable Bed. The Frame around the Barryroe Mirror is made from Solid Oak and Oak Veneers. The Barryroe 3-Drawer Dressing Table Set complements the Barryroe Electric Adjustable Bed. The Barryroe 3-Drawer Dressing Table Set is finished in a Solid Oak Vaneer with tongue and grooved solid drawers with a Solid Oak Top,finished with modern Heavy Round Brass Knobs. Width: 400mm(15.74 inches).Depth: 350mm(13.77 inches). Width: 530mm(20.86 inches).Depth : 70mm(2.75 inches). The Barryroe Double Door Wardrobe complements the Barryroe Electric Adjustable Bed. The Barryroe Wardrobe is made from Solid Oak and Oak Veneers, finished with heavy duty Round Brass Knobs. Width: 800mm(31.5inches). Depth: 500mm(19.7 inches). Height: 1820mm(71.65inches). The Barryroe 3-Drawer Bed Side Locker complements the Barryroe Electric Adjustable Bed. The Barryroe 3-Drawer Bed Side Locker is made from Solid Oak and Oak Veneers, finished with heavy duty round brass knobs. Depth: 350mm(13.7inches). Height: 600mm(23.6 inches). The Barryroe 4-Drawer Chest complements the Barryroe Electric Adjustable Bed. 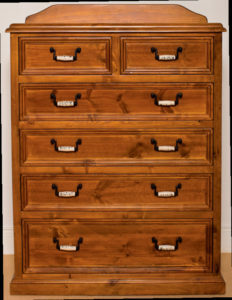 The Barryroe 4-Drawer Chest is made from Solid Oak and Oak Veneers,finished with heavy duty round brass knobs. Depth: 400mm(15.7 inches). Height: 1020mm(40.15inches). Depth: 420mm(16.5 inches). Height: 1200mm(47.25inches). The Barryroe Triple Wardrobe with Mirror complements the Barryroe Electric Adjustable Bed. The Barryroe Triple Wardrobe is made from Solid Oak and Oak Veneers, finished with heavy duty round brass knobs. Depth: 500mm(19.7 inches). Height: 1820mm(71.65 inches). Depth: 450mm(17.7 inches). Height: 400mm(15.7 inches).